Snooks Eaglin was one of the more diverse artists during his time on the blues scene, forging a career as both a solo street performer as well as a more soulful yet ecelctic New Orleans-style bandleader. I've been very open about my great respect and admiration for what Black Top Records was doing in the 1980s and '90s, bringing drastically under-recorded artists into the studio and consistently putting out the best blues albums of that era. Eaglin's five Black Top CDs (three studio recordings and one live album), plus a compilation disc, rank as some of the the best of a bumper crop from the label. It's hard to pick a favorite from Eaglin's Black Top library, but if pressed to do so I'd opt for the 1989 release Out Of Nowhere. What puts Out Of Nowhere above the rest was Eaglin's version of Benny Spellman's classic "Lipstick Traces" (penned by Allen Toussaint) --- just an absolute fabulous song with Eaglin's guitar picking going off the charts. (NOTE: To view a live version of this song, with the world's greatest bass player, George Porter, accompanying Eaglin, check out this Youtube video - watching Snooks' fingers fly across the fretboard is a stimulating experience!). The version of "Lipstick Traces" is reason enough to add this disc to your collection, but there are another 11 numbers that are all equally good. In addition to Eaglin's rich vocals and exquisite guitar playing, the usual assortment of Black Top session stars were on-board to provide first-rate accompaniment without detracting from the star of the show. Among the names in the various backing bands are Anson Funderburgh (guitar), Ronnie Earl (guitar), Grady Gaines (sax), Kaz Kazanoff (sax), Ron Levy (organ), Lloyd Lambert (bass), and others. Eaglin was often referred to as a "human jukebox," and the wide range of musical styles on this disc reflect his diverse musical tastes. The Tommy Ridgley composition "Oh Lawdy, My Baby" has a distinct New Orleans beat, while Jerry McCain's "Young Girl" (featuring the great Sam Myers on harmonica) is a true swamp ballad. He also turns in wonderful renditions of The Falcons' "You're So Fine," Nappy Brown's "Well Well Baby-La," T-Bone Walker's slow, late night blues "West Side Baby," and The Isley Brothers' "It's Your Thing." But for something completely different be sure to check out "Kiss of Fire," an instrumental number that features only Snooks playing flamenco-style guitar --- just too cool! 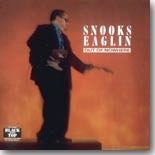 If you aren't real familiar with the music of Snooks Eaglin, Out Of Nowhere is a good place to start. But this man left us with a lot of great, great music when he passed away in 2009, so be forewarned --- you won't stop until you've accumulated everything he recorded!